There have been so many wonderful books written about World War II, but sometimes I get tired of reading them. It’s emotionally difficult for me to read about the holocaust over and over again, so I’ll admit that when I’m in the mood for historical fiction, I often prefer to grab something based in a different time period. 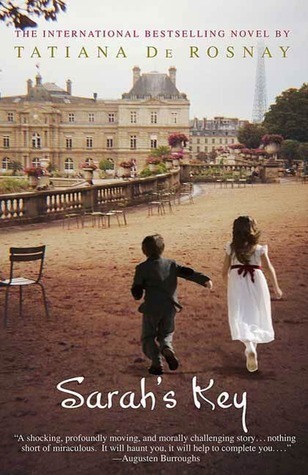 However, there is one book that I’m so glad I read because it was quite the gem: Sarah’s Key by Tatiana de Rosnay. This book is set in Paris and has two timelines: half of the book takes place during World War II and the other half takes place in the present. Both halves are intricately intertwined as the narrative in the present is also working towards discovering what happened in the aftermath of the events of the past. Typically, when I read books that have two big storylines or timelines, I find myself strongly preferring one over the other and wishing that there was a singular focus, but that was not the case for this book. I actually thought this worked beautifully and I was engaged with both timelines. This book explores very complicated themes but does so in a relatable and entertaining way. Whenever the past of World War II is getting too dark, the narrative switches to the complicated domestic relationships of the present. It has a good balance of light and dark and past and present and history and domesticity. I read it in one sitting because I was just so enamored that I didn’t want to put it down. So, for anyone who is looking for historical fiction, I would highly recommend Sarah’s Key. And if you, like me, are getting tired of reading World War II narratives, I assure you that this one can be set apart from the rest. It was a great reading experience. I am always looking for historical fiction recommendations. I’ll have to put this one my list! I think I’ve heard of it before but I am not sure why I haven’t picked it up yet.